believe it is apparent what an amazing family I have, but get this: the weekend before last while all the Meyer women gathered at my sister Missy’s house for my sister Michelle’s bridal shower, the Meyer boys spent the afternoon brewing up the first batch of homemade beer the Meyer Farm has seen. 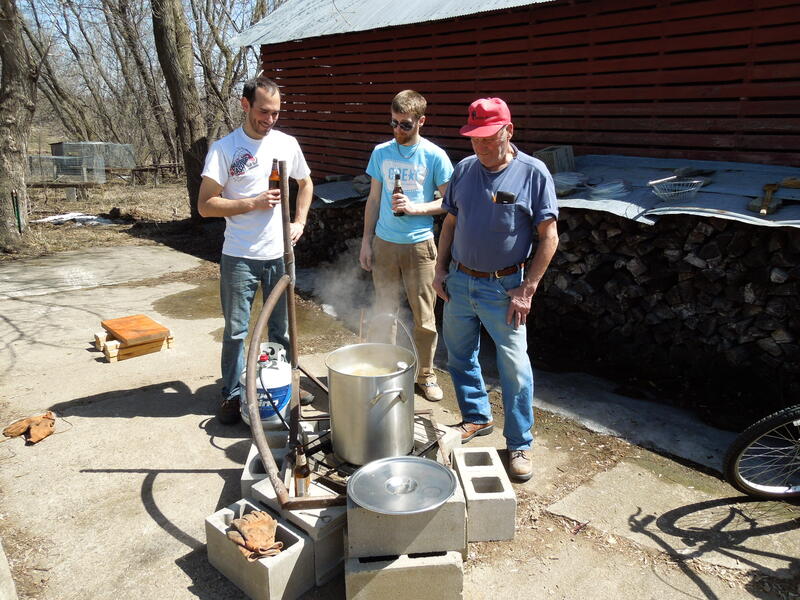 My soon to be brother-in-law, Dan, made a lot of maple syrup this spring tapping trees at his folks’ place, and expressed interest in brewing a beer with maple sap (not syrup) in place of water. 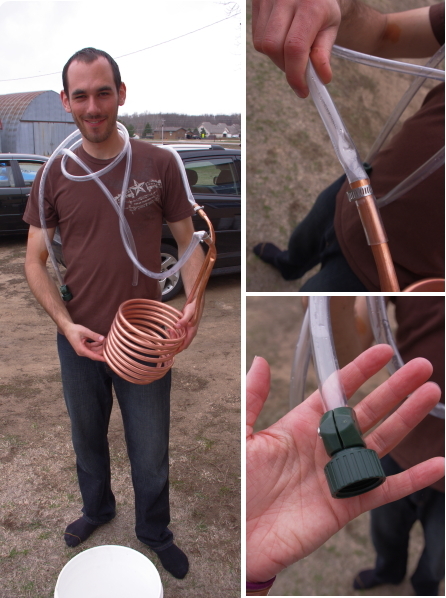 My brother-in-law, Kyle, when not hunting mushrooms, has been known to enjoy brewing beer. So they picked up a Belgian Blonde kit from Northern Brewer, collected (and made) some equipment and went to work. 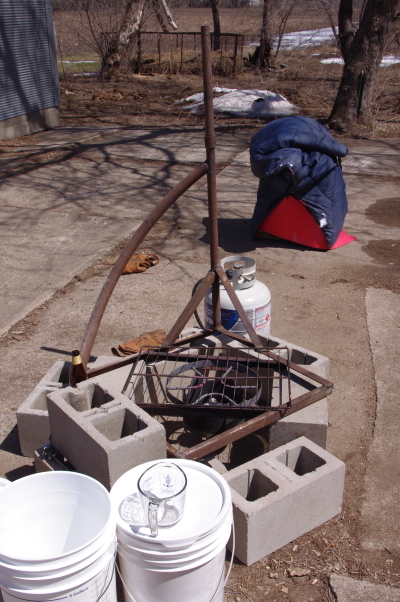 I offered the bouja kettle, but at 40 gallons, it was over-sized for making a 5 gallon batch of beer. 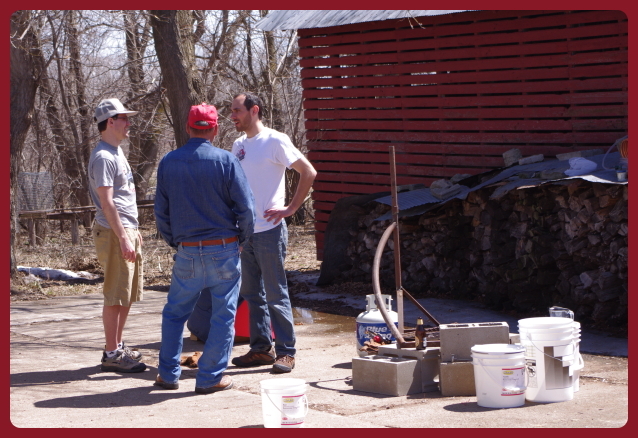 So with grandpa’s 10 gallon stock pot, they started by heating the 7.8 gallons of maple sap to 157 degrees. They then added the grains to the pot inside a large grain sock purchased from Northern Brewer. Please note, the timing, temperature, etc. may be specific to this particular kit beer. I am not a beer making expert, but merely trying to document a worthy venture of my male kinfolk in hope of inspiring others to try beer-making themselves. I should note, when brewing beer, sanitizing everything before it comes in contact with your batch is a must, the Meyer boys used Star-San, a common acid-based sanitizer used in brewing. Adding the grain brought the temp down to 152 degrees, and they then wrapped the kettle in foam pads and a sleeping bag! to try to insulate it. The goal being to keep the mash at 150 degrees for 90 minutes, which allows the grains to release sugars that the yeast will feast on. The word mash is used by brewers as a verb meaning, to release malt sugars by soaking grain in hot water, and also as a noun for the resultant mixture. After 90 min of mashing, they removed the sock with the grains and squeezed the liquid out as best they could, then put it back on the burner and brought it to a boil. The solution of grain sugars strained from the mash is called a wort, or sweet wort, later a brewed wort, fermenting wort and finally a beer. 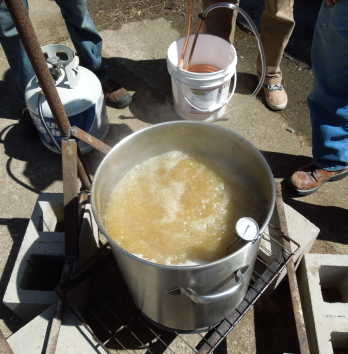 The wort is boiled for an hour to kill off any unwelcome bacteria or microbes. 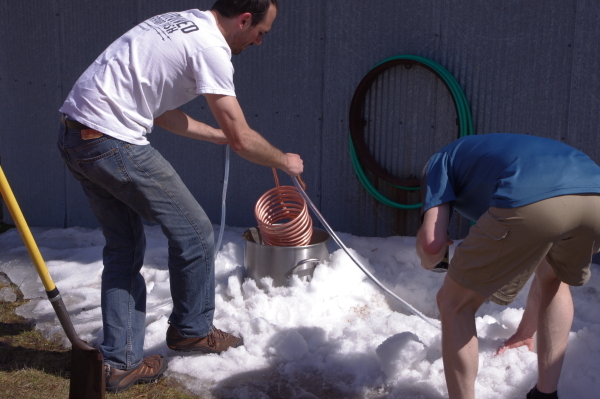 After hooking up the wort-chiller, they put the brewed wort into a snowbank and ran icy cold well water through it, and cooled it in a mere 7 minutes! When the wort was cooled to 68 degrees, it was then poured through a cloth strainer into the primary fermenter: an ale pail with a lid fitted with a bubbler. 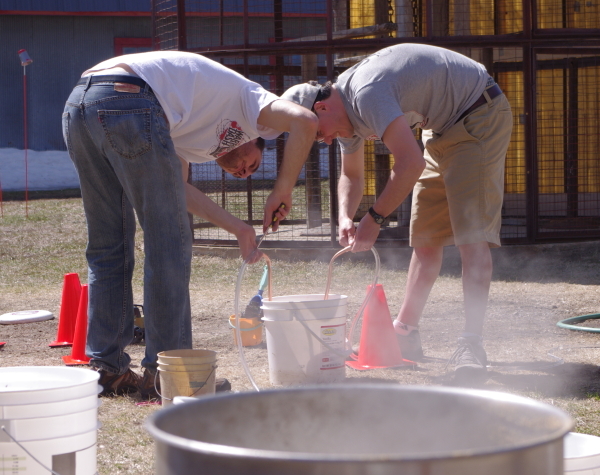 Then the liquid yeast was added to the pail and after sealing it up, it was shook hard to get the yeast going by oxygenating it. We have been trying to keep the fermenting wort between 65 and 75 degrees for this style of beer, for two weeks. At that point it will be syphoned off the old yeast that has settled to the bottom of the primary fermenter, into a secondary fermenter (a glass carboy) for the next two weeks. Syphoning it off the old yeast improves the beer’s clarity and taste. The last step will be to bottle it or keg it. Since we hope to drink it for the wedding, we will be carbonating it in a keg. If it was bottled with an addition of sugar, two to three weeks would be needed for the yeast to carbonate the bottled beer. I’d say a day well spent and a job well done. But we’ll see how it tastes…..